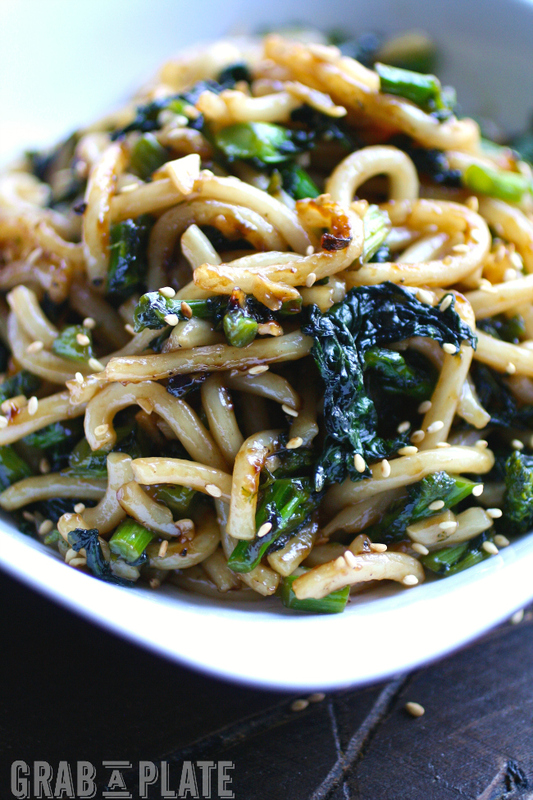 Pan-Fried Udon Noodles with Garlic and Rapini is the perfect quick-cook meal with great flavor and texture. I like to think of this dish as an international delight, with components from Italian, Japanese, and Chinese cooking. A recent Sunday meal started out like many in my life: pasta would be on the menu. There was a bunch of rapini (also known as broccoli rabe) sitting in my fridge – and I can’t make rapini without garlic – so mealtime was clearly leaning toward Italian. Then I remembered that I had udon noodles in the cupboard. Udon noodles are thick and chewy, and cook so quickly. Yea, they’re pretty much my favorite noodle. (Please keep that nugget of info to yourself. I mean, what would my Italian mom think if she found out?) This is when things took a turn toward a Japanese-inspired meal. When you have noodles on the brain, check out a few more of my noodle recipes, like Cold Sesame-Peanut Noodle Salad and Bucatini with Wilted Dandelion Greens and Anchovy Sauce. So what sort of sauce would I add to these noodles? I wanted something that was easy to make and that would come together quickly, since the only thing I had gorged on eaten so far on this particular Sunday was leftover Halloween candy. I had Chinese oyster sauce in the fridge? Okay then! 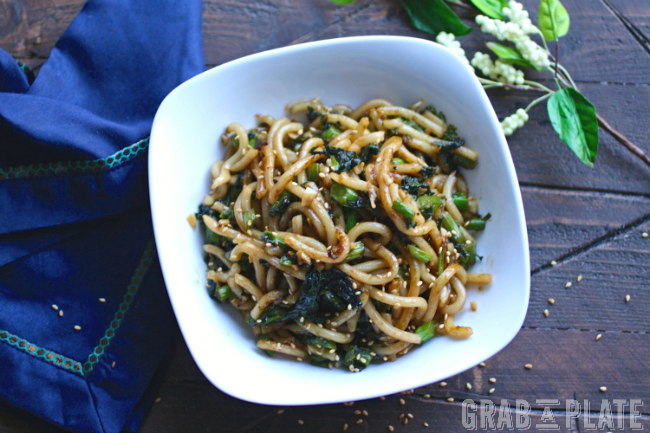 I grabbed it and used it to make the sauce for what would become Pan-Fried Udon Noodles with Garlic and Rapini – a perfect combo of Italian, Japanese, and Chinese influences. You’ll love this noodle dish! The sauce turns the noodles sticky, with some bits that get a little crispy from cooking them in the skillet. The slightly bitter rapini and the zesty garlic mix well with the oyster sauce for a quick and fabulous dish. 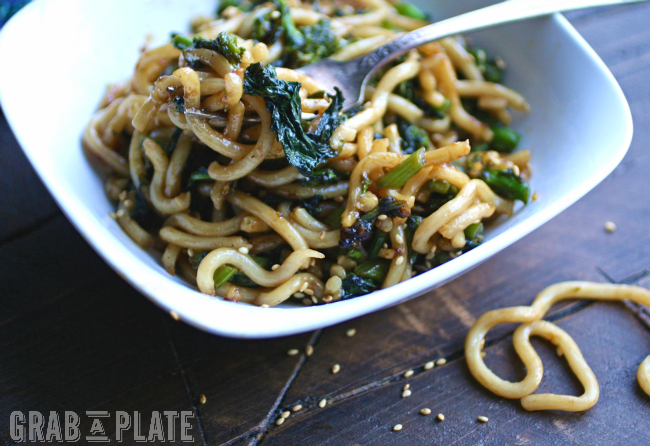 Pan-Fried Udon Noodles with Garlic and Rapini is an amazing, filling, and flavorful dish. Make it soon – you’ll love it! And it makes a much better meal than leftover Halloween candy! This is a flavorful and filling dish with inspiration from Italian, Japanese, and Chinese cooking. It's so easy to make, and you'll also love how quickly it comes together. In a small bowl, whisk together the water, oyster sauce, and brown sugar. Set aside. Add the sesame oil to a large wok or nonstick skillet over medium heat. When hot, add the rapini stems and cook for about 2 minutes. Add the remaining rapini and cook for a few additional minutes. Add the garlic and cook for 30 seconds. Add about half the liquid to the skillet, season with the black pepper, and toss to combine. Add the noodles to the skillet and increase the heat to high. Cook, stirring occasionally for about 5 minutes. Add the remaining liquid to the skillet and cook for a few more minutes, or until the liquid cooks down and the noodles become sticky and coated in the sauce. Toss and serve immediately garnished with sesame seeds. This is a meatless dish, but to keep it vegetarian, please use a vegetarian oyster sauce. Hi, Patricia. I'm Italian as well. I love a great pasta,or noodle dish espcially when it has a veggie focus. This one appeals to the garlic lover in me. It looks terrific! Thank you, Melissa! I love pretty much anything and everything about garlic, too -- the more, the merrier :) Enjoy! Thank you, Heather! Hope you enjoy it! Yum, this looks great! I was wondering if rapini and broccoli rabe were the same, and I see that seems to be the case. Thank you, David! Yep - it sure is! I should have mentioned that in the post, so thanks for bringing it to my attention! nommy nomm nom! This looks so awesome! I could eat the whole thing right now! Thanks, Debi! I know - me, too, but didn't have ANY leftovers! I can not wait to make this! Love the ingredients and how quick and easy this recipe is. This dish sounds delicious, I really love anything garlicky. YUM! Oh, me too! I love it! Thank you! This seems like such a fast, delicious and filling meal! Can't wait to try! Definitely all of the above :) Thank you!! This looks and sounds awesome! Love the addition of the rapini! I love all types of Asian food. Sounds great! This looks so good, I always order udon at the Japanese restaurant so I can't wait to make it at home! Awesome! I think you'll really like how easy this is to make! Thanks so much, Sara! I absolutely love pan-fried udon noodles! One of my go-to things to make when I'm in a pinch! Great dish, Patricia! My husband loves udon noodles! This is a perfect recipe to share with him! That's great! Hope you try this and enjoy. Thank you, Sabrina! Wow... You had me at noodles and garlic. Thanks for posting this recipe. I will try it. Yum, right! Thanks so much, Nakeya! I admire your ingenuity with this one! I love udon noodles, and I can honestly say I've never had them prepared quite like this before, but it sounds awesome! Sounds good, Roxanne! Thanks for stopping by! Oh man.. I have a love affair with udon noodles! Cannot wait to try this recipe! Udon noodles and oyster sauce are the perfect combo for a quick and delicious meal. I seriously wish I had these in front of me for dinner tonight. Thanks so much! I know...unfortunately I didn't have any leftovers :( Good thing this is so easy to make! Looks amazing! I love how simple this recipe is. I'll have to give this a try. Thanks, Evi! Definitely simple, filling, and flavorful! This looks delicious, I've re-pinned it to make this weekend. Thanks! Thanks, Diane! I hope you like them as much as I do! Love the look of this dish. Need to try pan frying my noodles. Hi Nicole! Easy to make, so hope you can give them a try :) Thanks! I order Udon noodles every chance I get. Now I have a great recipe to follow! I'm the exact same, Suzy! They're soooo easy to make! Hope you try them. Thanks!! Thanks, Camilla! You might also know rapini as broccoli rabe. You could sub any number of greens and still have a filling dish! Hi Hayli - thanks so much! Yeah - I feel the same way :) I hope you do give this a try - so easy to make! This looks so delicious! I could definitely go for some of these noodles right about now! YUM! This looks like something I would really like to try. I'm going to add this to my meal plan and see if my family likes it! Thanks! Thanks, Kate! I hope everyone enjoys it! I love udon noodles! I think these sound amazing! I pinned the recipe! Thanks, Missy! I hope you like this dish! Oh how I envy your ability to create your own recipes from whatever is on hand in the fridge and pantry! This dish looks incredibly delicious, and filling. I'd never heard of udon noodles before, but they sound wonderful. I will definitely be trying this recipe in the very near future! Hi Cait - thanks for your kind words! I hope you try udon noodles -- look in the Asian food section at the grocery store. They're really good! This looks so tasty! Can't wait to try it! Very! And tasty, too! Thanks, Lauren! Hi Lynda! Maybe you could use broccoli or spinach, or your favorite greens! I hope it works. Thank you! Yum! This looks amazing and easy enough that even I can make it. Saving for later. It's really good, and easy to make, Helen! Thanks! It's breakfast time here in Maine as I'm reading this - yet my mouth is watering looking at this dish! I have most of the ingredients - so I think I'm going to have to try a modified version of this for lunch. Yummmmy! Well it's never too soon to think about lunch or dinner! I hope you give this a try and enjoy! Thank you! Nice twist on an Asian dish. Hesistant at first but it turned out very well. Thanks, Dylan! Glad you liked it!